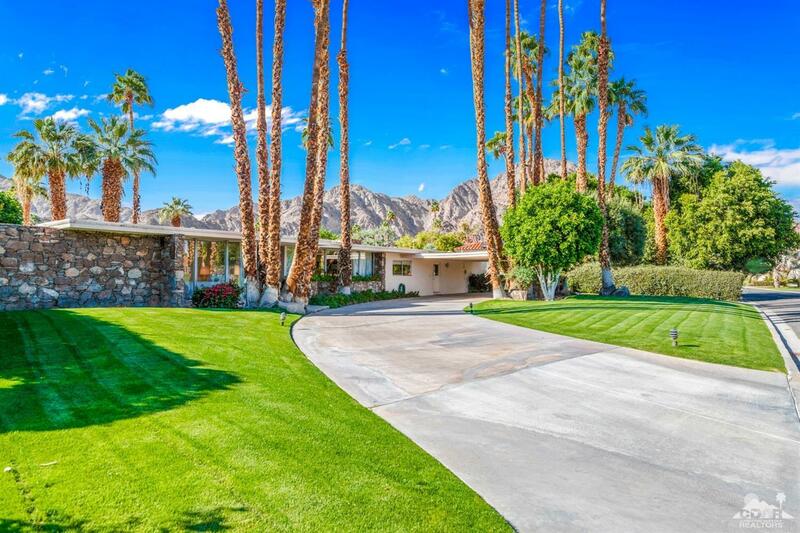 A fantastic opportunity to own an authentic mid-century property nestled behind the private gates at La Quinta Country Club Golf Estates. This home has the perfect location within walking distance to the La Quinta Resort & Spa and a short drive to Old Town La Quinta! The stone accents, mature palm trees and circular driveway attribute to the major curb appeal accenting the clean lines of the architecture. The double door entry leads to the spacious living room with stone fireplace, golf course views and a back wall of glass looking out to the pool terrace and stunning mountain views. The kitchen takes advantage of the golf course views and opens to the dining room and a fantastic morning room. Sliding doors make it easy for all 3 bedrooms to enjoy the outdoors. The backyard lends to endless fun in the sun and privacy in your own refreshing pool, plenty of patio space & lawn area with lush landscaping & fruit trees. This is a great property and a must see.